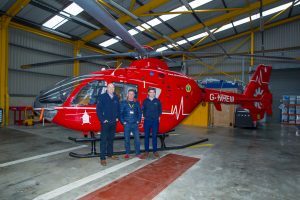 TLI Group has chosen Air Ambulance Northern Ireland (AANI) as their charity of the year for 2019 and staff members Sean McMahon, Mike Murphy and Mark Martin visited the AANI base on Tuesday 5 February to launch the partnership. Sean McMahon Quantity Surveyor at TLI group said “At TLI Group the nature of our work sees us working in very close contact with local communities and we feel it is only right to give back to these communities where we can. We asked our staff to vote and AANI was chosen as our charity partner for the year. AANI is making an amazing difference to people right across Northern Ireland. TLI Group are a critical utility infrastructure contractor operating throughout Ireland, Northern Ireland and the UK. The company specialises in the design and build of overhead lines, substations and telecom networks. TLI Group was established in 2000 and has developed substantially over the last number of years into a trusted delivery partner of clients such as NIE Networks, ESB Networks, SSE, WPD and SIRO. The company delivers highly critical infrastructure projects to the highest standards of safety, quality and professionalism.